The haulage industry is more often a family affair than not as businesses are handed down from generation to generation and quite frankly it is something that is in the blood. 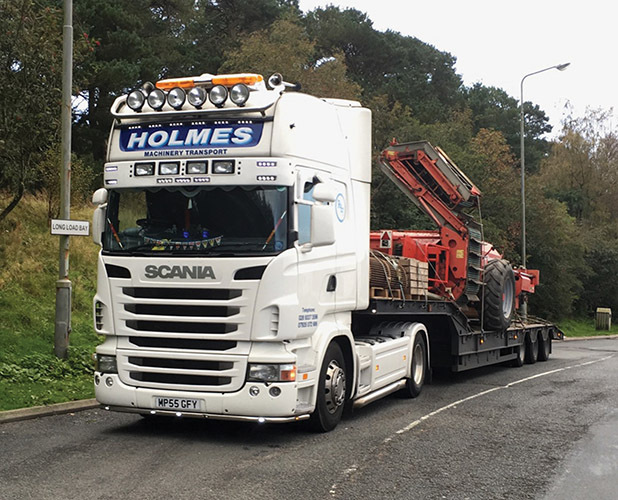 Holmes Transport was established five years ago by Ryan Holmes who provides a low loader and flat trailer service to his ever increasing customer base. Five years may not be a long time in the industry, but Ryan grew up in the transport sector as the Holmes name has been associated with haulage since as far back as the late sixties when Adrian Holmes first set up the business in Carrickfergus, Co Antrim. That was then taken over by his son Colin who took the company forward and now his son Ryan is established in his own right. To his credit, Ryan passed his test at 18 years of age and at the time was surely one of the youngest haulage drivers in the U.K. Two years later and the young man from Co Antrim invested in his first truck. That was five years ago, and now he has four trucks on the road which are mainly hauling machinery for independent dealers to and from Northern Ireland to the mainland U.K.
“Ninety-nine percent of our work would be low-loader work hauling machinery for dealers throughout Ireland and the U.K. We would do a bit of work in Europe as well,” revealed Ryan. To carry out their work to the best of their abilities, Holmes Transport operates a modern and well maintained fleet of trucks with a lot of focus being placed on avoiding downtime. “I like to upgrade the fleet on a regular basis and keep it fresh. We use to hire the trucks, but find its more cost efficient to buy them. I wouldn't use any specific dealer and would shop around for the best deal. “We have our own mechanic and workshop at the yard, so any maintenance work that needs to be done is carried as when necessary. The aim is to keep the trucks on the road as much as legally possible. The haulage industry is known for its time constraints in many areas, but Ryan admitted that there was a little more leeway in the area that he operates in. Ryan stressed that there are many overheads to contend with in the haulage industry, but added that a good customer base can ease the strain somewhat. “The shipping rates went up there a while back and I was considering cutting back the work load, but I decided not too and we explained our predicament to our customers and they had no problem with the increase, which was great to hear. A good relationship with their customers has played a part in the success of the business, while Ryan hasn't forgot the team that supports him on a daily basis. “I would have a very good relationship with all our customers, we have been with them for a few years now and we pride ourselves on giving them a good service. In order to make full use of their fleet, Ryan hauls straw in from the mainland U.K as part of their backloads and this is an area of the business that is growing all the time. “Yeah, we bring straw in from the U.K for farmers as backloads. It means that we are not returning home with nothing and making full use of the fleet. This is an area that has got busier in recent times.